This publication was originally written as a text for a business communication course and has subsequently been expanded. It sets out to explain some business communication issues and hopefully assist in making you a better communicator, both at work and in your personal life. For business success the ability to communicate at different levels, by a variety of methods, to peers and superiors, sideways to your counterparts and downward to people you are supervising is essential. ABC television produced a documentary recently which detailed the events and deals surrounding numerous failed entrepreneurs. Despite their failings their ability to communicate (and at one time influence others) stood out. 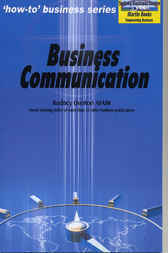 Communication in business is a far more complex subject than is generally acknowledged. Many people in business flippantly talk about ‘communication problems’, without even stopping to realise the implications of what they have said. Everybody has their favourite communication story, usually one that casts the people involved in a bad light. One of our favourites concerns two executive directors of a company who made a point of working at opposite ends of the same building. When a meeting between them was necessary an appointment was arranged, invariably some days into the future! On a personal level many people enjoy observing patrons dining at restaurants and picking ‘the married ones’ - those who are not talking to each other and gazing into space. It is gratifying to record that this book is used a training handbook by a number of organisations.